I'm only about 10k xp away from researching Amagi and I'm earning ~5k xp each battle in Nagato so I want to know what to expect. I'm running a secondary build on Nagato right now (everything except for manual secondaries) I've heard great things about Amagi. Just eyeballing Amagi (wiki is borked), I'm seeing thinner armour (but thicker bows), it doesn't look like Amagi can bowtank and still fire as many secondary guns forward because they aren't "stacked" in front like Nagato. I have this problem... I still want to go with a secondary build but the secondary positioning is giving me doubts (more HE shells going out sounds nice though) and I don't know if the guns are as accurate as those on Nagato. Amagi can bow tank to a certain point but the thing is, you don't get Amagi for her secondaries nor her ability to decently bow tank-you get Amagi for what she can do that no other Tier 8 BB can do: Kite extremely well. Kiting is key in an Amagi and I would recommend a stealth build and the accuracy module to take full advantage of the Amagi. Because Amagi's accuracy is better than Nagato's and might as well be unrivaled, making it even more insane is a good way to ensure damage. And the rudder shift is good when you get the hang of it. I agree with almost everything above it's refreshing to finally be able to land salvos at range but... While kiting and concealment are indeed well suited to her Amagi's secondaries are quite good and she can brawl and hold her own as well. Not to say you should actively go seeking a brawl but a secondary build on her is both viable and fun. Amagi had great secondaries before the Germans made it cool. Seriously, this is one of the greatest ships but does not get the hype of the newer lines. Unfortunately, it's followed by Izumo. Play her like a cruiser and have fun. Amagi can seem almost as immortal as a nelson if you put a zombie build on it(all the fire skills, plus superintendent and JoaT). Your detection is pretty underwhelming and your secondaries fire AP. But your guns, maneuverability, and armor are fantastic. You shouldn't bow tank in Amagi 99% of the time. You want to angle and use all your 10 guns. You have turtle back and pretty trollish armor against all non-460mm shells. How important is stealth for a battleship anyway? I usually fight in my battleship within 5-15km of whatever I'm shooting at, and I don't usually stop firing if I can. Just based on Duke of York, which I have CE on I don't think stealth battleships are my thing. Amagi is all about her guns and survivability. Don't bother with her secondaries as she's supposed to be a kiter and at higher tiers, closing the distance in a BB just to use your secondaries is a death sentence, especially against CAs with torps and/or potent AP. 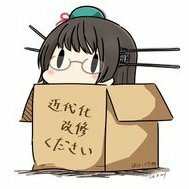 Stealth on Amagi is surprisingly effective because if you spec her out, her detection range falls down to roughly 13.5km. With that kind of stealth, you can sneak up on an unsuspecting BB/CA and for her, such range is literally point blank. 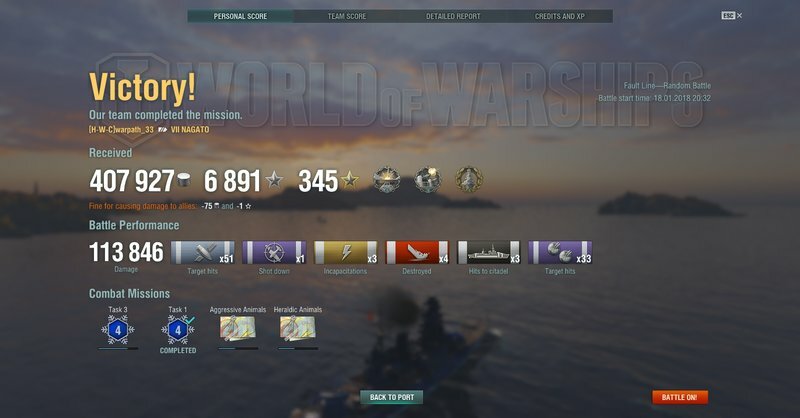 Heck in an earlier game I was able to get out of a Conqueror's sights while in an Izumo just as he dropped me down to 1000ish HP, as I gave her a stealth build. That gave me all the time I needed to quickly heal up get out of his firing range, and shoot back a few more times before our CV took care of him. What you learned in Nagato you will capitalize on Amagi. 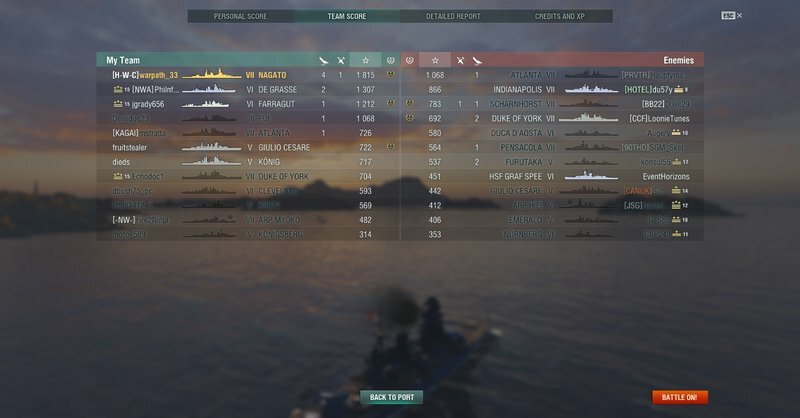 Just be prepared for RNG to mess you up at times, such as a game where 4 AP shells bounced from a 73HP King George V.
To be honest even with a secondaries build I don't plan to bum rush the first battleship I see, it's more because the fight for a cap tends to get long enough that we close the distance with the enemy team really. Plus it doubles as a semi AA build so that's nice. I still plan to get the concealment module though. I'll test Amagi without a third module first to see if I need the accuracy (Nagato really didn't to be honest) and decide whether to go secondaries or main guns from there. Secondary Amagi is great. This is the build i run on my captain. Basics of Survivability then Adrenaline Rush were my last two skills, respectively. I use the secondaries mod and rudder shift. The others mods are kind of obvious. Shes can brawl just about anything, and her turtleback keeps her safe while doing it. Those pathetic germans cant touch her and ive yet to loose a brawl to Bismark. Derpitz drivers dont brawl much better so long as you plan ahead and stay out of torp range. Otherwise, her guns at range are great till you get an opening to push in. When folks talk trash about AP secondaries, i usually just post these types of results. No, her secondaries dont start many fires, but that AP is solid regardless. People are just too hung up on fire. Bunch of pyromaniacs i think. Full disclosure: i hate concealment builds on battleships. I want the enemy shooting at me, thats part of my damn job. If they are shooting at me, theyre not shooting at my DDs and CAs. Hiding in the back pretending to help out firing at things 20 kms away doesnt do a thing for my team. Found this to be a good way. Used Flamu's suggested build. Amagi guns are very accurate for a bb. Scored some cruiser kills and Cits at very long distance. And if a BB gives you a broadside, well. I played my first battle in Amagi today. No upgrades and I got dragged into a tier 10 game. 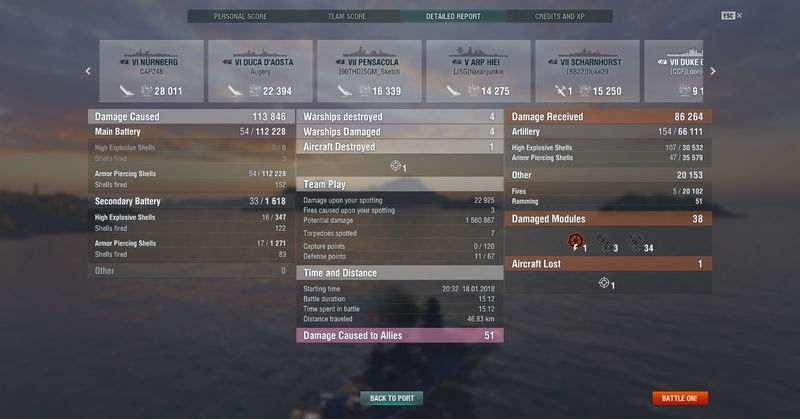 I did 57k damage and we lost. Guns seem accurate enough, so I went secondaries for lols. One thing I will say though... matchmaking isn't nearly as kind as it is to Nagato. Second game: tier 10 game again, this time running MAM1, DCSM1, SBM2, and SGM2, and I was still stock. 4th on XP, 75k damage, fireproof (a lot of my was me dueling a broadside Monarch shooting nothing but HE), 1 enemy sunk (that Monarch again). This time we won. Standard consumables for both games. 2 wins and 5 losses so far. Must be a combination of being new to high tier meta and stock ship, since I've heard nothing but praise for this ship. If you think that's bad, wait til you get to the Izumo. I found Amagi a fun ship. Use maneurverability to kite and accurate guns. Izumo is purgatory; a few good games, but mostly frustrating and a v. slow grind. Hope Yamato is heaven-like enough to make it worthwhile. And, unless you are some super player, you have little control over how the games go. Lots of sucky teams assembled by MM and you can't do much about it. Sorta like RNG. Not only is Amagis accuracy the 2nd worst of all the tier 8 BB's (only better than kiis) its far worse than nagatos pin point accurate guns, Id actually say overall nagato is a better ship due to better range accuracy and it turns much better. I don't know how you decide that but IJN BBs have the best mid to long range horizontal dispersion. 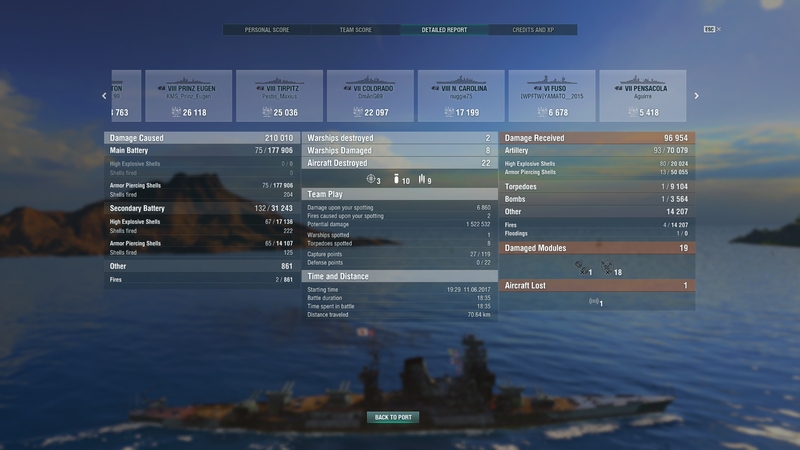 Never have problem doing massive damage to cruisers at max range in my Amagi. As for vertical dispersion, NC is the king. But I don't see Amagi being worse than German BBs in this regard. Usually horizontal dispersion isnt a problem (except in new mexico) and its that vertical dispersion that completely kills well aimed ship. But also Amagi is one of the best accurate IJN ships its like the fuso mk2, you're a shotgun, get slightly closer than a normal IJN BB would and fire all guns into the enemies broadside for massive damage the amagi however has the stealth advantage and a turtleback to make it even better for this, I never said amagi wasnt good, but calling it accurate isn't exactly correct. I feel the max horizontal dispersion is an undervalued stat. For example, I feel my guns are way more consistent on iowa/missouri after switching from reload to dispersion reduction module. And I always do more consistently with IJN BB guns. The only thing I can attribute to is the max horizontal dispersion. Id prefer high horizontal dispersion over vertical, a nice spread across a battleship or a cruiser can land some good damage but if you fire 10 shots and 4 go high 4 go low then 2 land you're not going to do much. Concealment is extremely important in the current meta. It is one of the cornerstones of any survivability build, along with Fire Prevention. You need to be able to disengage freely and that is nearly impossible to do if you aren't running stealth. It also allows you the tactical flexibility to pick your fights more easily, and get closer to the enemy before you fire, which both gives them less time to dodge and also effectively reduces your dispersion. Umm... How about Bismarck and Tirpitz? Those guns are the definition of inaccurate.